The Lampada Poltrona lamp is as ingenious as it is unusual, designed by Luigi Caccia Dominioni to hang over the back of a chair or bedhead. 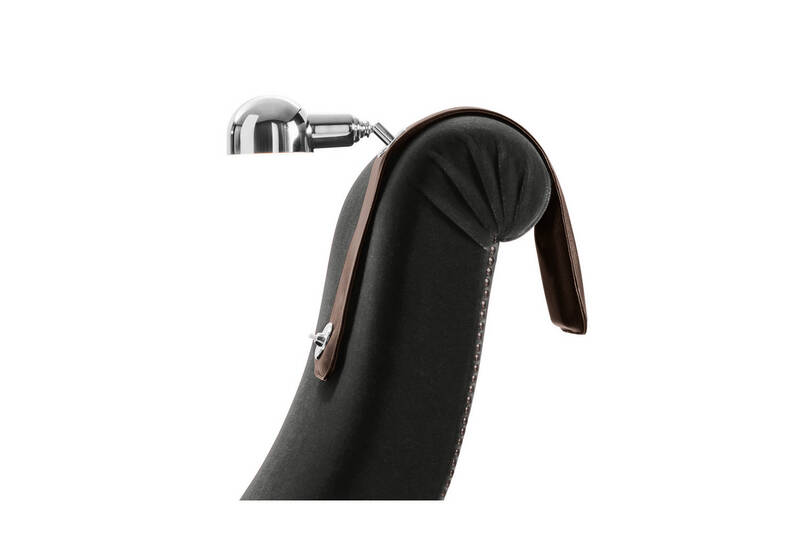 It’s an adjustable spotlight attached to a length of leather and weighted at either end to ensure it stays in place. The idea is taken from the finest tailors who place lead tape into their jacket hems to guarantee the perfect hang. The press-button switch is both functional and decorative and archetypal in its own right. In common with many of his designs, Caccia Dominioni placed a premium on mobility - the lamp can easily be moved from one room to the next, more of an accessory than a piece of furniture. The idea came to Caccia Dominioni on seeing and deciding to improve on an "ugly but functional" lamp belonging to his sister-in-law. What we have is a fusion of objet trouve and home-made, so typical of twentieth century contemporary art. With a masterly touch these separate objects have been merged to form a delightful piece of Italian craftsmanship. As Luigi Caccia Dominioni himself declared - the lamp is "elegant of course, efficient obviously but most of all eccentric".